Sweepstakes: Magnetic Metal Kegel Balls Weighted – Training Device for… | FreebieOrBust Freebies! Take a shot at winning your favorite item – you never know when you could win big. It all starts with action – Sign up and register for the chance to win today! Believe in yourself and seize the opportunity to win with us right now! 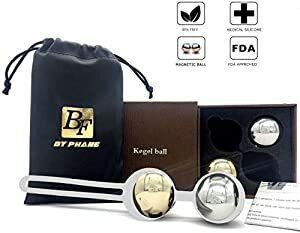 Magnetic Metal Kegel Balls Weighted – Training Device for Women Kegel Exercise Ben Wa Balls Weighted for Beginner & Advanced Strengthen Pelvic Floor Bladder Tightening. Odds of winning: 1:700. A total of 4 prizes are available. Giveaway hosted by Amazon and Byphane. With thousands of sweepstakes available, our community members have multiple chances to get lucky every day! Our team uploads hundreds of new sweepstakes deals every week, giving you more opportunities to win!